HIS is an American bird, and has been described under various names by various authors. It is found in the lower parts of Pennsylvania, in the state of New York, and in New England, particularly in autumn, when the berries of the sour gum are ripe, on the kernels of which it eagerly feeds. As a singer it has few superiors. It frequently sings at night, and even all night, the notes being extremely clear and mellow. It does not acquire its full colors until at least the second spring or summer. It is found as far east as Nova Scotia, as far west as Nebraska, and winters in great numbers in Guatemala. This Grosbeak is common in southern Indiana, northern Illinois, and western Iowa. It is usually seen in open woods, on the borders of streams, but frequently sings in the deep recesses of forests. In Mr. Nuttall’s opinion this species has no superior in song, except the Mocking Bird. 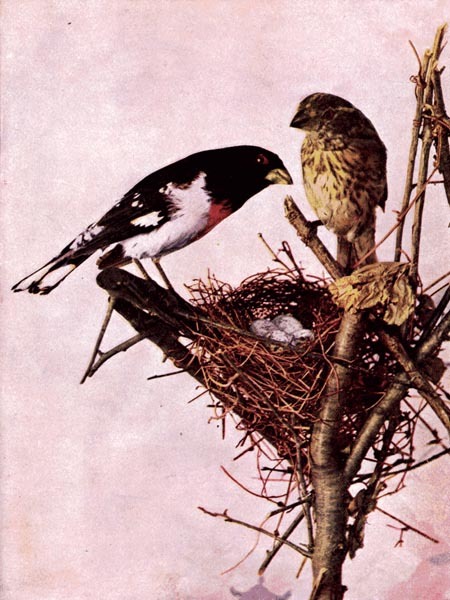 The Rose-Breasted Grosbeaks arrive in May and nest early in June. They build in low trees on the edges of woods, frequently in small groves on the banks of streams. The nest is coarsely built of waste stubble, fragments of leaves, and stems of plants, intermingled with and strengthened by twigs and coarser stems. It is eight inches wide, and three and a half high, with a cavity three inches in diameter and one in depth, being quite shallow for so large a nest. 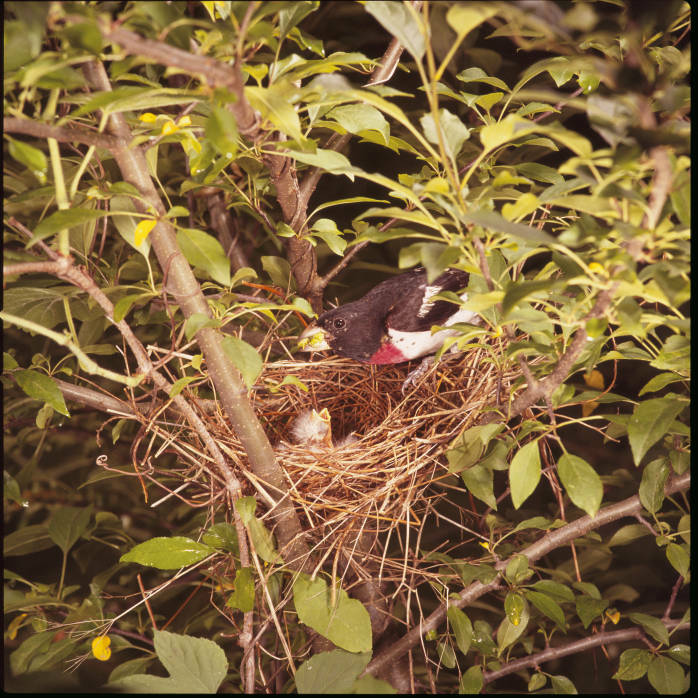 Dr. Hoy, of Racine, states that on the 15th of June, within six miles of that city, he found seven nests, all within a space of not over five acres, and he was assured that each year they resort to the same locality and nest in this social manner. Six of these nests were in thorn-trees, all were within six to ten feet of the ground, near the center of the top. Three of the four parent birds sitting on the nests were males. When a nest was disturbed, all the neighboring Grosbeaks gathered and appeared equally interested. It is frequently observed early in the month of March, making its way eastward. At this period it passes at a considerable height in the air. On the banks of the Schuylkill, early in May, it has been seen feeding on the tender buds of trees. It eats various kinds of food, such as hemp-seed, insects, grasshoppers, and crickets with peculiar relish. It eats flies and wasps, and great numbers of these pests are destroyed by its strong bill. During bright moonshiny nights the Grosbeak sings sweetly, but not loudly. In the daytime, when singing, it has the habit of vibrating its wings, in the manner of the Mocking-bird. The male takes turns with his mate in sitting on the eggs. He is so happy when on the nest that he sings loud and long. His music is sometimes the cause of great mourning in the lovely family because it tells the egg hunter where to find the precious nest. The Rose-breasted Grosbeak, Pheucticus ludovicianus, is a large seed-eating songbird in the cardinal family. It breeds in cool-temperate North America, migrating to tropical America in winter. 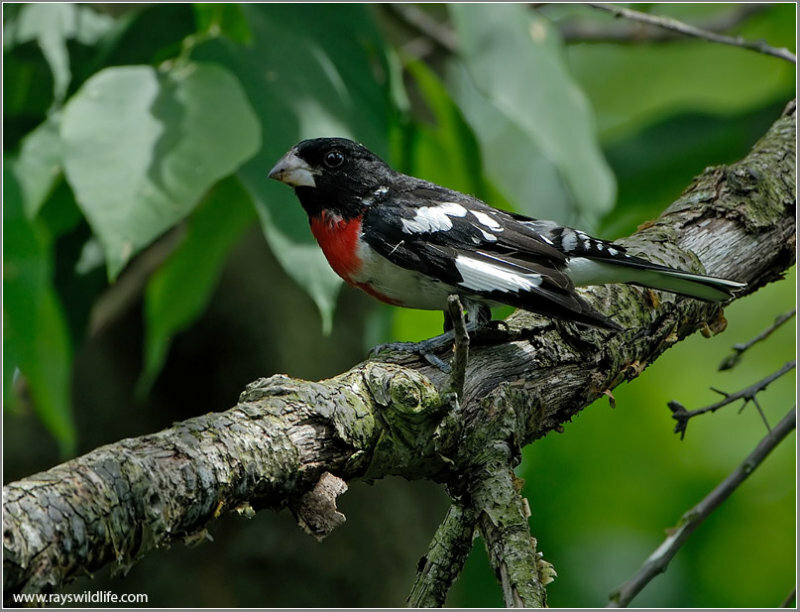 They belong to the Cardinalidae – Grosbeaks, Saltators & Allies Family. Adult birds are 7.1–7.5 in (18–19 cm) long and weigh 1.6–1.7 oz (45–47 g) on average. At all ages and in both sexes, the beak is dusky horn-colored, and the feet and eyes are dark. The adult male in breeding plumage has a black head, wings, back and tail, and a bright rose-red patch on its breast; the wings have two white patches and rose-red linings. Its underside and rump are white. Males in nonbreeding plumage have largely white underparts, supercilium and cheeks. The upperside feathers have brown fringes, most wing feathers white ones, giving a scaly appearance. The bases of the primary remiges are also white. The adult female has dark grey-brown upperparts – darker on wings and tail –, a white supercilium, a buff stripe along the top of the head, and black-streaked white underparts, which except in the center of the belly have a buff tinge. The wing linings are yellowish, and on the upperwing there are two white patches like in the summer male. Immatures are similar, but with pink wing-linings and less prominent streaks and usually a pinkish-buff hue on the throat and breast. At one year of age—in their first breeding season—males are scaly above like fully adult males in winter plumage, and still retail the immature’s browner wings. The song is a subdued mellow warbling, resembling a more refined version of the American Robin’s (Turdus migratorius). Males start singing early, occasionally even when still in winter quarters. The call is a sharp pink or pick. 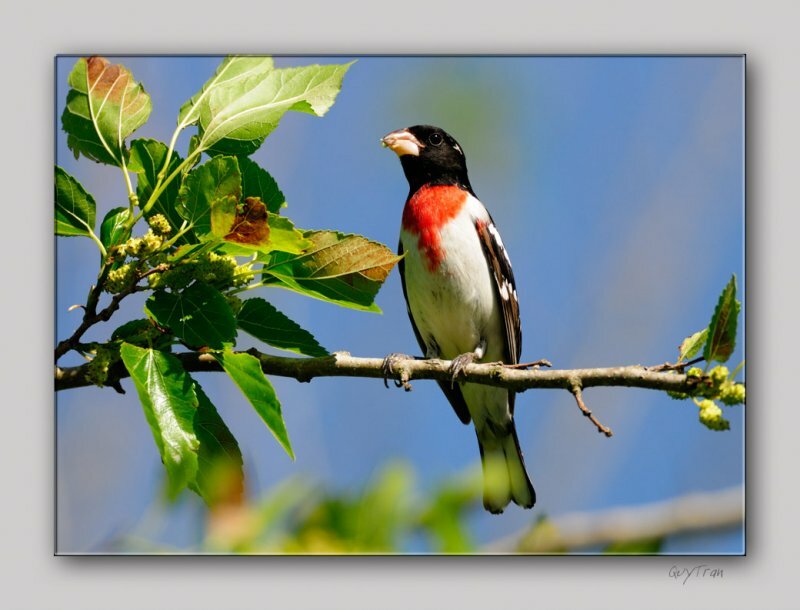 The Rose-breasted Grosbeak’s breeding habitat is open deciduous woods across most of Canada and the northeastern USA. In particular the northern birds migrate south through the United States east of the Rocky Mountains, to winter from central-southern Mexico through Central America and the Caribbean to Peru and Venezuela. The southern limit of its wintering range is not well known; it was for example only recorded in the Serranía de las Quinchas (Colombia) in the 1990s. In winter, they prefer more open woodland, or similar habitat with a loose growth of trees, such as forest edges, parks, gardens and plantations, ranging from sea level into the hills, e.g. up to 5,000 ft (1,500 m) ASL in Costa Rica. The first birds leave the breeding grounds as early as August, while the last ones do not return until mid-late May. In general, however, they migrate south in late September or in October, and return in late April or early May. It appears as if they remain on their breeding grounds longer today than they did in the early 20th century, when migrants were more commonly seen in May and August than in April or September. The Rose-breasted Grosbeak occurs as a very rare vagrant in western Europe. It builds a twig nest in a tree or large shrub. The Rose-breasted Grosbeak forages in shrubs or trees for insects, seeds and berries, also catching insects in flight and occasionally eating nectar. It usually keeps to the treetops, and only rarely can be seen on the ground. During breeding it is fairly territorial; in winter, it roams the lands in groups of about a handful of birds, and sometimes in larger flocks of a dozen or more. In the winter quarters, they can be attracted into parks, gardens, and possibly even to bird feeders by fruit like Trophis racemosa. Other notable winter food includes Jacaranda seeds and the fruits of the introduced Busy Lizzy (Impatiens walleriana). 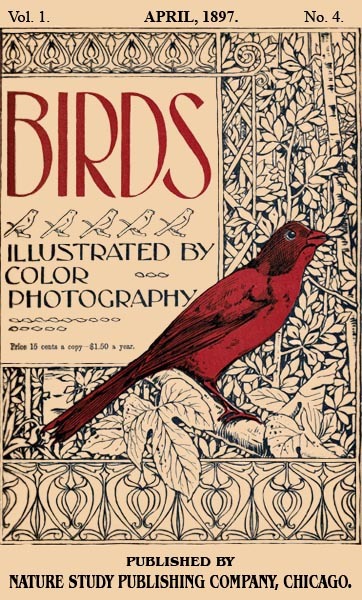 This entry was posted in Birds, Kid's Section and tagged Birds Illustrated by Color Photography, Birdwatching, Cardinalidae, Christian, From The Past, Grosbeak, Home School, Kids, Nature, Vol 1 #4 April 1897, Youth. Bookmark the permalink. Another favorite! Soon, soon we hope to see them again. I enjoy seeing pictures of papa birds helping raise their families. Thanks for the wonderful post. I found it very interesting that the Grosbeak will sometimes sing at night. Thank you for the wholesome website. Thanks for the compliment. I also did not know of the night songs, but we don’t see them here, at least I haven’t seen any. Our night singer is the Mockingbird. Sorry, but I wouldn’t have a clue. Was it injured or looked like something had attacked it? Maybe it had hit a window and then made it as far as the feeder. Did not appear attacked, just found dead on the ground below the feeder. such a beautiful bird. I wait all winter for it’s arrival. Will it’s mate be Ok? I know a had two males at my feeder.